Over years of planning, building, and repairing fences in and around the community of Paterson. Fence Installation Paterson NJ has built a strong reputation as a reliable, high quality, and fair fence company. We started with friends and family who needed fences, expanded into residential. And now cover everything from residential to commercial, dozens of different fencing materials, designs, colors, and more for our clients. As our company has grown in size and scale. We’ve worked hard to maintain our focus on the quality of the job and delivering each client 100% satisfaction. Why choose Paterson Fence Installation ? Getting to this point hasn’t been easy, and we’re happy with what we’ve done so far and eager to keep expanding. This local website is our most recent expansion to help make the process of getting your fence needs as smoothly as possible. Please have a look around at your leisure, and feel free to contact us for a free quote or with any questions you might have. A well built fence will last a long time, whether it’s wood, chain link, or vinyl. The key is to pick the right type of material for the job and desires of the client and to construct it properly following all industry guidelines to avoid unnecessary weathering. Experience is king in the fence industry, and our team of highly trained men and women have years of experience building strong and aesthetic fences. We understand that our clients expect a lot from a professional fence contractor, so we have a dedicated process that ensures every box is checked every time we build a fence. Our fence company NJ staff is able to meet any deadlines, work with any material or design you request, and fix any damage. Paterson Fence Company provide every type of fence installation and services. But to make things simpler for everyone visiting our site. We’ve broken them up into 6 main service topics that are briefly covered below. Each section has a full-service page under our services banner. So please feel free to navigate to the relevant service page for full details on it. As a company that works closely with our clients to achieve the exact desired outcome. It’s important for us to be on the same page about what’s available and all that we can do for you. If you have any questions that these pages can’t answer, or if you prefer to talk with us in person. Just give us a call and we’ll be more than happy to provide all the information you’re looking for. Residential fencing projects always stand out to us because a lot of homeowner wants something that will serve as more than just a fence. Not only does it need to be strong, durable, and long-lasting. It also needs to look great and match the home’s design and decor. Determining what our clients want, building it, and seeing them smile as they admire the result is always particularly rewarding for residential fences. Because we know they’ll enjoy their home even more for years to come. We build and repair all forms of residential fencing in the Paterson, New Jersey, area. For more info on our residential fencing services, please click here. You may not be in love with how most chain link fencing looks, but nobody can argue with its results. It’s fast to install, extremely effective at the things it’s built to do, and very affordable. For both commercial fencing and residential fencing, chain link can be a perfect choice. That keeps people and pests out, your pets and kids in, and so on, without breaking the bank. It’s also long-lasting and very durable versus storms and harsh weather. With many fence heights and designs to choose from, chain link is always one to be considered. For more information about it, please check out our Paterson chain link fence service page. Vinyl fences don’t have anything to do with music or awesome old records, but they do have a lot to do with versatile, strong, flexible, and beautiful fences that can be highly customized to perfectly match your needs. A vinyl fence is just a fence made out of polvinyl chloride, also known as vinyl or PVC. It’s the world’s third most produced synthetic plastic for a reason, and 75% of it is used in construction projects. That should say quite a bit about how versatile and practical it can be. After completing hundreds of projects with different fencing materials and designs we believe a vinyl fence is a fantastic option for many fencing situations. For more information about the advantages of vinyl fencing installation and vinyl fence costs, please see the relevant service page. There’s something classic about a wood fence. Despite the new materials available for contractors today, wood is still used in essentially every construction project and has been designed and implemented in a thousand different ways all over the world. It’s been around for thousands of years for a reason, and it’s because it’s always worth considering for a strong, beautiful, and long-lasting structure or fence. As long as your fence contractor knows how to build it properly using proven industry methods and standards, you will get years and years of use out of a beautiful wood fence. It’s a great material and always a pleasure to work with. To learn more, please check out our wood fence service page here. Businesses are the lifeblood of our great nation without them we wouldn’t have jobs, services, products, and a wonderful life. That’s why it’s always a particular pleasure to work with a business owner to install or repair a fence. That will make their business more secure, more safe, and more attractive to customers and clients. Whether you need a strong fence for security reasons, branding reasons, or to change the layout of your property. We can quickly, efficiently, and professionally install the exact fence system you need. A business lives and dies by the flow of work getting done. Whether it’s customers coming in and purchasing or whether it’s getting things built or shipped out. It doesn’t matter what you do, your time is precious and we understand that fact. We ensure each job is conducted efficiently and with attention to detail. And we always clean up the site afterward. That is just one of the reasons why fence company Paterson NJ is the best in the area. Our world isn’t easy on anything, and fences are no different. 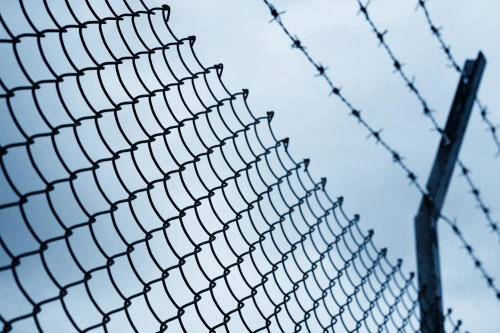 Professional contractors do everything possible to limit any natural wear and tear that fences are exposed to by poor weather, humidity, bugs, and so on, but fences still find themselves in need of some repair here and there. Not all fences were built according to the same code so some will deteriorate faster than others, and sometimes physical damage will occur due to a limb falling or human intervention. When this happens, it would be our pleasure to be the ones you call to get it back in perfect working order. Our fence repair service page here has much more information available, and please don’t hesitate to call us with any questions you might have about your particular repair situation. Our contact information is readily accessible on each page of this site, so please don’t hesitate to reach out with any questions or comments you have. We are always available at the number listed above and that is probably the fastest way to get in touch. However, if you prefer, you can fill out the form and we’ll contact you back with the information you requested. No matter what method you use to contact us, we will respond quickly and cordially. It’s always great to hear from you, and we look forward to discussing your project with you. Here at Paterson Fence Company we take care to make sure each and every client is satisfied and happy with their fence project. Check us out on Facebook!